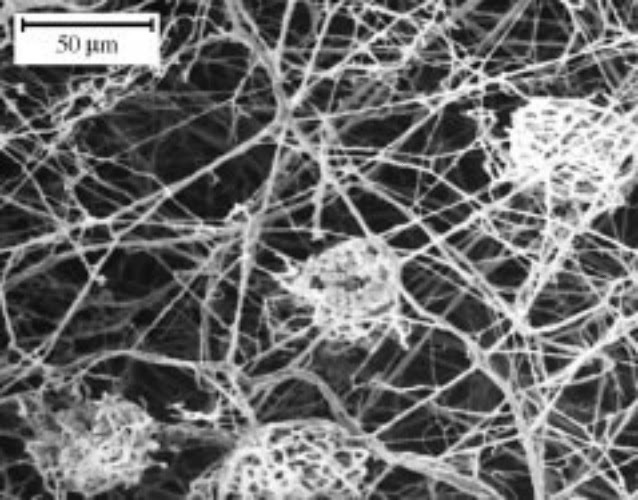 Hyphae with poorly-differentiated fruiting bodies of Gymnascella marismortui, from Buchalo et al. (1998). Three years ago, Christopher and I visited my aunt in Jordan. We spent a week visiting various parts of the country (Petra is amazing), including that most touristy of all activities, swimming in the Dead Sea. Except 'swimming' is not really the right word for what you do in the Dead Sea: with the salt content of the water and hence your own buoyancy so high, normal swimming movements are practically impossible. You can't do much more than bob along on your back*. Standing back up again is equally disconcerting: the extra force required to push your legs back down through the water is such that it is quite startling to discover that the bottom is only about two feet below you. The water has a not-particularly-pleasant greasy feel to it, and at one point I had a drop of it splash onto my lower lip. To my surprise, I could not really describe the taste of that drop as salty. Rather, I would say that what the Dead Sea tastes of is Pain. *But not too far. One bather had a congregation of guards on the shore suddenly begin yelling at her, evidently because she was swimming too far out and was about to inadvertently invade Israel. It's hard to believe that anything could live in such conditions, but there is life there. Salt-loving prokaryotes and unicellular dense algae can sometimes form dense blooms, and in 1998 Buchalo et al. described the filamentous fungus Gymnascella marismortui, grown from spores collected in Dead Sea water. Fungal hyphae where observed growing on wood in the Dead Sea in spots where its saltiness had been diluted, such as by the inflow of freshwater springs or rain. Gymnascella marismortui may play a significant role in breaking down wood or other plant material that has been washed into the Sea. 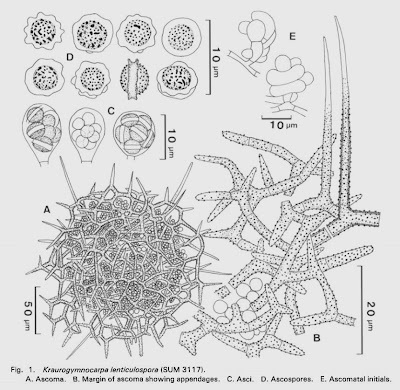 Reproductive structures of Kraurogymnocarpa lenticulospora, from Udagawa & Uchiyama (1999). 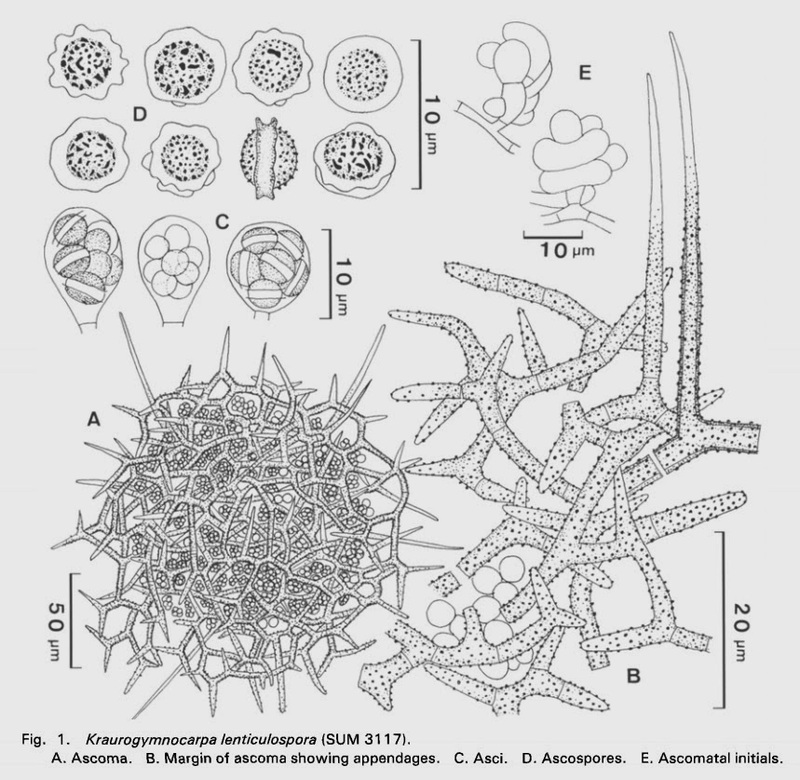 Gymnascella marismortui is just one species in a family of microscopic fungi known as the Gymnoascaceae. The prefix gymno- in the name means 'naked', and refers to the fact that these fungi do not have the asci (spore-packets) surrounded by a strongly differentiated fruiting-body wall. Instead, the asci are surrounded by a cluster of hyphae that are little differentiated from the remainder of the fungus, or that form a net-like arrangement called a reticuloperidium (an example of the latter can be seen in the lower left of the figure above). Greif & Currah (2003) suggested that the reticuloperidium may be an adaptation to dispersal by insects, as they became caught on the hairs of flies and were then split open to release the spores when the fly was grooming itself. The ascospores themselves are oblate in shape, with polar depressions or equatorial thickenings. Gymnoascaceae are found in such habitats as soil, rotting vegetation or dung, where they break down substances such as cellulose and keratin (Stchigel & Guarro 2007). Apart from their largely unsung role as decomposers, Gymnoascaceae have little economic impact on humans. They are relatives of the fungi that cause ringworm and tinea (indeed, these fungi have been included in the Gymnoascaceae in the past), and there have been occasional reports of Gymnoascaceae causing similar infections. However, these infections were probably just incidental: after all, to a fungus, keratin is keratin. Buchalo, A. S., E. Nevo, S. P. Wasser, A. Oren & H. P. Molitoris. 1998. Fungal life in the extremely hypersaline water of the Dead Sea: first records. Proceedings of the Royal Society of London Series B 265: 1461-1465. Greif, M. D., & R. S. Currah. 2003. A functional interpretation of the role of the reticuloperidium in whole-ascoma dispersal by arthropods. Mycological Research 107 (1): 77-81. Stchigel, A. M., & J. Guarro. 2007. A reassessment of cleistothecia as a taxonomic character. Mycological Research 111 (9): 1100-1115. Udagawa, S., & S. Uchiyama. 1999. Taxonomic studies on new or critical fungi of non-pathogenic Onygenales 1. Mycoscience 40: 277-290. Entertaining description of the Dead Sea! And the fungus is interesting too. Enjoyed this post very much. Thanks, Christopher. The specific name marismortui means "of the dead sea", appropriately enough.